Tá baile Bhéal na mBuillí suite i bparóistí dlí Bhuimlinne agus Chill Trostáin, Co. Ros Comáin. Tá toghroinn ann den ainm sin chomh maith. Mar leis an ainm Strokestown de, is amhlaidh a leathaistríodh go Béarla ainm Gaeilge bhaile fearainn Bellanamullia – leathaistriúchán míchruinn atá ann ó thaobh na staire de. Tá an baile fearainn deireanach timpeall trí chiliméadar taobh thoir de bhaile Bhéal na mBuillí agus is inmheasta gur thoir ann a bhí láthair an bhaile tráth. 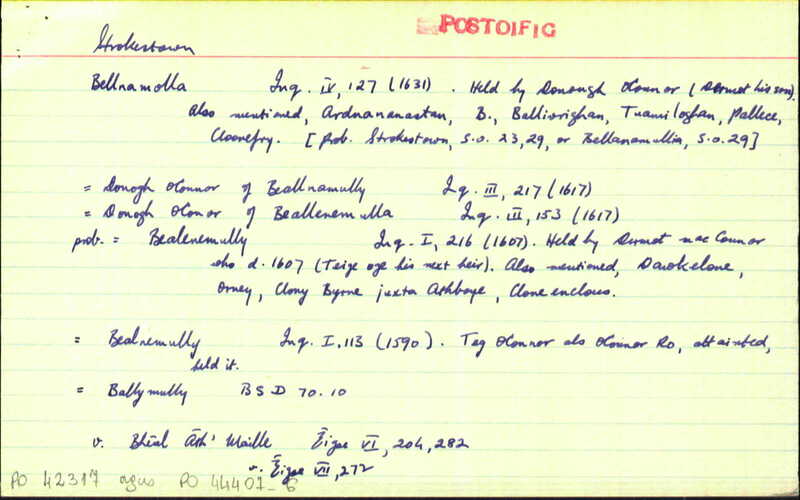 Tá ainm bunaidh Gaeilge Bellanamullia luaite in Annála Connacht in iontrálacha bhlianta 1411 agus 1421, Beoil (gineadach Béal) na Muilled. Luaitear caisleán nó dúnfort den ainm Bél na Muilnedh in Annála Locha Cé chomh maith, faoin mbliain 1552 agus b’fhéidir gurb í an áit chéanna í. Is é an chiall atá le Béal na Muilleadh nó Muilneadh ná, ‘the mouth / approach of the mills’. 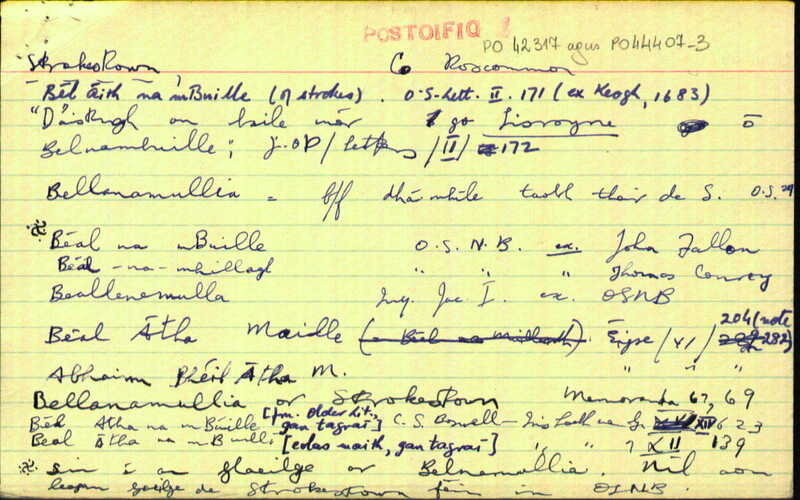 De réir Books of Survey and Distribution, Co. Roscommon, bhí muileann ramhraithe san áit i lár an seachtú haois déag. 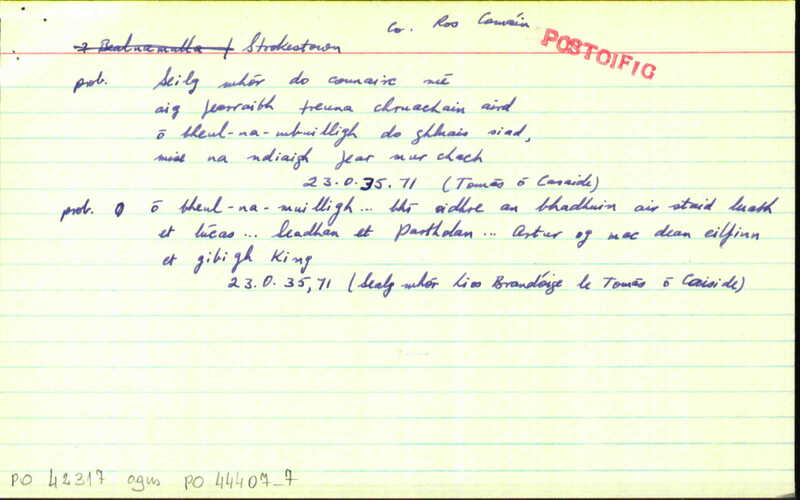 Ina theannta sin, sa chuntas a scríobh an tUrramach John Keogh sa bhliain 1683 faoi Strokestown – a bhfuil sleachta tugtha as i Litreacha na Suirbhéireachta Ordanáis, Co. Ros Comáin (bliain 1837) – thagair sé do: ‘a small stream … serving to turn three or four mills’. Béal Áth’ Maille an fhoirm Ghaeilge a bhreac Micheál Ó Braonáin ó Co. Ros Comáin i ndán fada faoin tSionainn a chum seisean sa bhliain 1794. Ba dhóigh linn gur cuireadh Áth le Béal ar mhúnla a lán logainmneacha eile dar tús Béal Átha; ‘fordmouth’ is brí leis. I measc na samplaí atá curtha le chéile ag an mBrainse Logainmneacha, deonaíodh do Nicholas Mahon aontaí agus margaí a bheith i ‘Ballynemully’ sa bhliain 1671. Ní foláir nó bhí bunús an bhaile ann faoin tráth sin. Tagairt dhéanach í sin mar ba ghairid ina dhiaidh sin gur cuireadh Strokestown i scríbhinn. Is mar seo a thosaigh cuntas réamhráite an Urr. 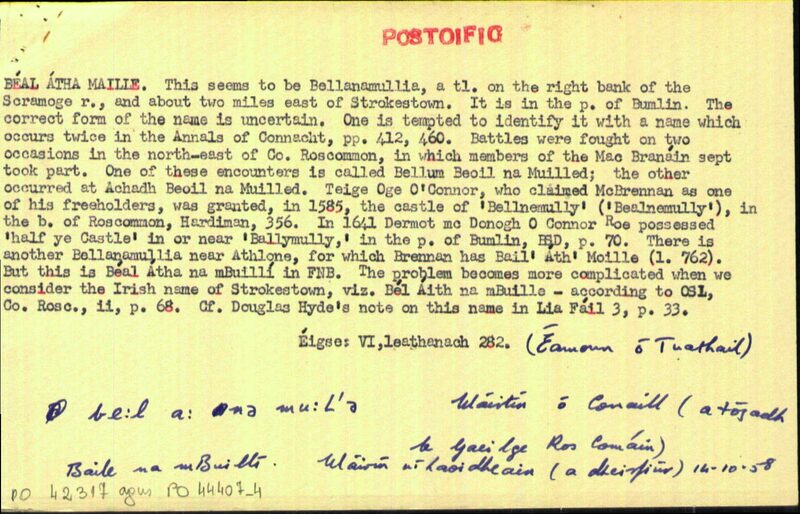 Keogh sa bhliain 1683 (de réir Litreacha na Suirbhéireachta Ordanáis): ‘As for Strokestown it is in Irish called Belawhnamully, Béal Áith na mBuille, word for word, “the pass ... of the ford of strokes”, there having been some strokes of battle given heretofore, which gave denomination to the place’. Úsáideadh an focal stroke san aistriúchán Béarla mar gheall air seo. 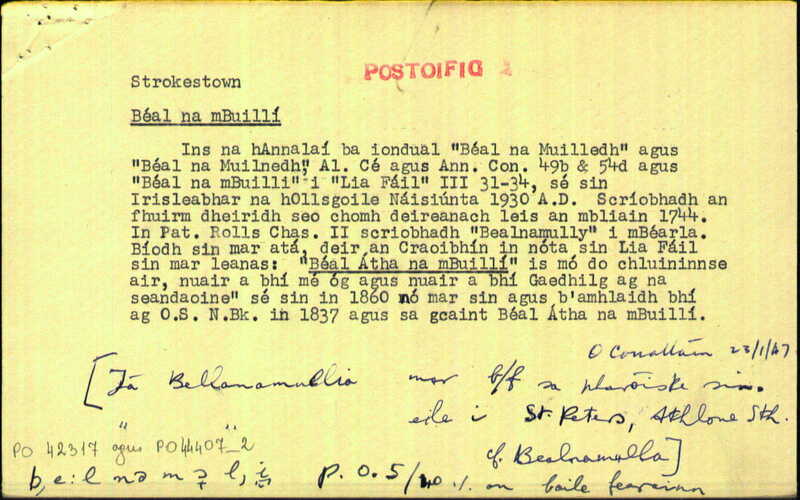 Comhainmneacha is ea (Béal na) mBuille agus Muille / Muilleadh i nGaeilge (.i. míreanna foclóireachta arb ionann fuaimniú dóibh ach nach ionann brí dóibh). Ó tharla go gciallaíonn buille ‘stroke’ nó ‘blow’ i nGaeilge, níor dhóichí rud de ná gur athraigh brí an logainm i measc cainteoirí Gaeilge agus gur as sin a tháinig Strokes-town. Tá fianaise áirithe ann a chuireann leis an teoiric seo. I gceann d’Ainmleabhair Pharóiste na Suirbhéireachta Ordanáis, ba é an t-ainm Gaeilge a bhí ag duine de na faisnéiseoirí (John Fallon) ar Strokestown ná Béal na mBuille. 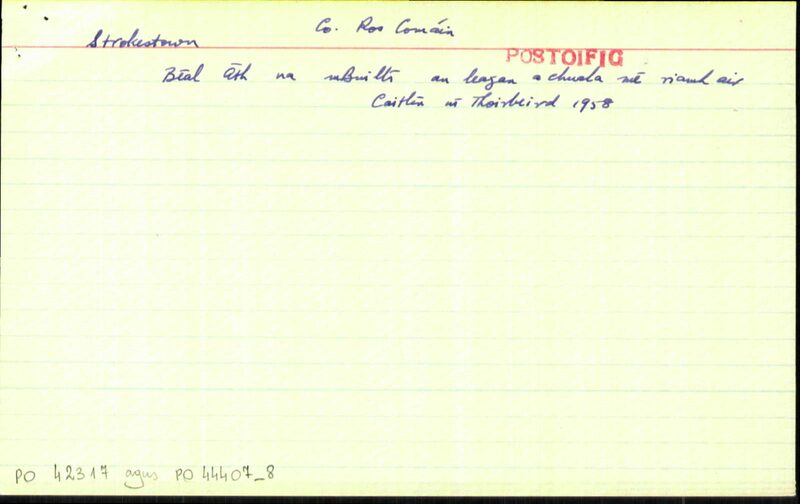 Ina dhiaidh sin, scríobh Dubhghlas de hÍde go dtugadh seandaoine Béal Áth na mBuille ar an áit nuair a bhi seisean óg. Is cosúil go bhfuil foirm traslitrithe Béarla an Urr. 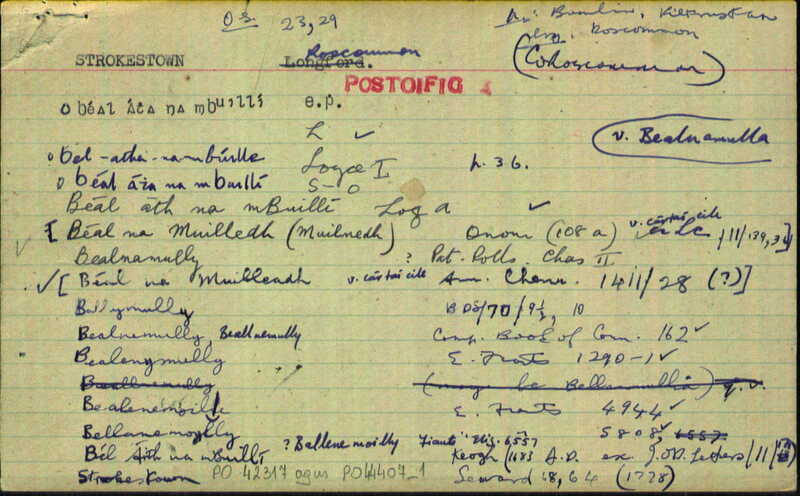 John Keogh, Belawhnamhully, ar aon dul leis an bhfoirm Ghaeilge dheireanach. 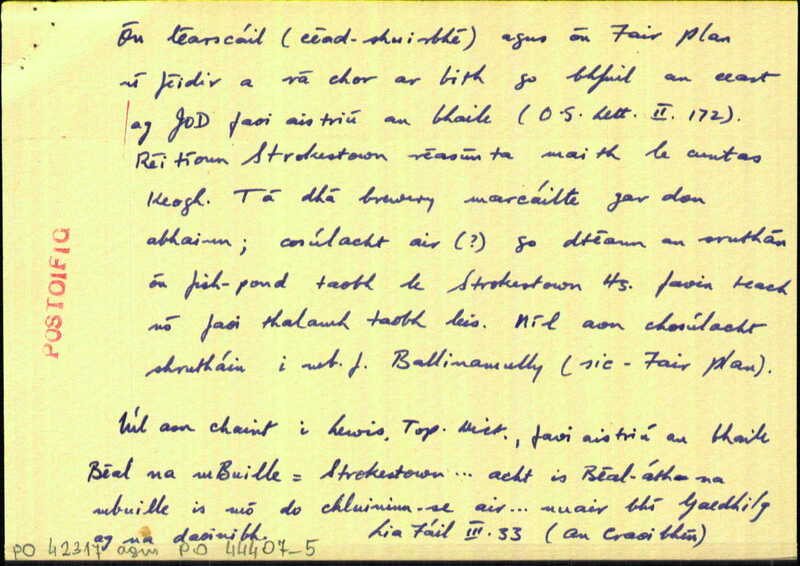 Scríobhadh béul-na-mbuilligh i lámhscríbhinn Gaeilge ón ochtú haois déag. Ó thaobh Béal na mBuillí de, leagan oifigiúil Gaeilge an lae inniu, tá Áth(a) fágtha ar lár ann agus tugtar aitheantas don athrú brí atá taobh thiar de Strokes-town; buillí iolra caighdeánach buille.